The Chairs released its first full-length last spring, and has since pro­duced two EPs, and now a sec­ond album. 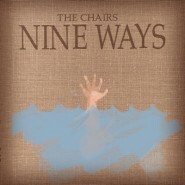 Due out on the 17th, Nine Ways is sim­ply an incred­i­ble album, some­thing not even the out­stand­ing­ly high quan­ti­ty of work The Chairs pro­duced this year could sti­fle. The album show­cas­es nine rather unique ways to die, or more accu­rate­ly, to be killed, not only in each of its tracks (dur­ing which a total of eigh­teen peo­ple pass away) but on the var­i­ous album cov­ers (yes, there are mul­ti­ple cov­ers), each cor­re­spond­ing to a track and method of death. But Nine Ways is not just more mor­bid than the band’s last album: it is also more exper­i­men­tal, more detailed, and more intel­li­gent. Nine Ways is noth­ing short of an amaz­ing album. Oth­er than occa­sion­al dull patch­es such as in “Time Machines, pt. 2,” Nine Ways is, in every way, a near per­fect album. The del­i­cate inter­twin­ing of the two gui­tars on “Biggest Fan” is fol­lowed by the out­ra­geous­ly loud, hilar­i­ous­ly indul­gent “Char­lotte Pipe.” No track los­es direc­tion, either with­in itself or with­in the broad­er sense of the album, and every track show­cas­es the musi­cal tal­ent of the band. “Ele­phant Sea” tops them all. An eight-minute-long epic, it sounds like noth­ing ever played before and some­thing few would dare to repeat. Trav­el­ing through pre­vi­ous­ly undis­cov­ered chord pro­gres­sions and digres­sions, it alone makes the album worth­while. The amount of atten­tion spent on match­ing every­thing per­fect­ly is sim­ply ridicu­lous. “Requiem” opens with an organ, the instru­men­tal cli­max of “I Wish” is per­fect­ly placed, and the dreamy sound of “Hot Air Bal­loon” per­fect­ly show­cas­es its unique­ness. And the same amount of atten­tion was clear­ly spent on immac­u­late­ly record­ing the album. Best shown on “David,” the detail in each per­cus­sive note is astound­ing. Alex Schaaf’s strik­ing vocals haven’t weak­ened a bit since The Chairs’ excel­lent debut, Laugh, It’s a Fright. In fact, thanks in part to the sense of exper­i­men­ta­tion around Nine Ways, they have devel­oped and improved to fit the new highs and lows of The Chairs’ chang­ing style. Nine Ways is in many ways a more somber album than Laugh, and Schaaf proves that he can han­dle such a mood in as skilled a way as the (most­ly) light mood of the ear­li­er album. At the same time, how­ev­er, nei­ther Schaaf nor The Chairs as a whole ever lose the sense of whim­sy which makes their music so enjoy­able. A com­bi­na­tion of vocal styles, from the deep­er, more har­mo­nious style of “David” to the sim­pler style of “Char­lotte Pipe,” to the hor­ri­fy­ing inno­cence of “Biggest Fan” gives Nine Ways an impres­sive sense of vari­ety, pre­vent­ing it from ever seem­ing stag­nant or repet­i­tive. Even the eight-minute “Ele­phant Sea” remains inter­est­ing thanks to yet anoth­er cre­ative vocal style (this one an intense, omnipresent sound). Lay­er­ing and vocal effects are used expert­ly through­out the album, includ­ing on “Walk You Out,” fur­ther devel­op­ing the vocal sound of the album. Every bit of the ener­gy which made Laugh such a great album is present here, used in a vari­ety of cre­ative ways. In the words of The Chairs, Nine Ways is nine “tales of life and death” (with the “death” part of that dichoto­my thor­ough­ly empha­sized). The Chairs han­dle such a top­ic with their typ­i­cal cre­ativ­i­ty, with­out allow­ing it to weigh them down undu­ly. Yes, it’s dark - but it’s dark in a way that only The Chairs could man­age. Each of the nine sto­ries that make up the album is quite well con­struct­ed as well as thought-pro­vok­ing, begin­ning with “David,” which chron­i­cles the death by burn­ing of the title char­ac­ter: “David don’t you know / That you’re on fire / That you’re on fire?” As David coun­ters with “I’ll be a mar­tyr,” Schaaf tells the entire sto­ry, intro­duc­ing each of the main char­ac­ters: Susan, who “left him,” Mar­garet, who “was try­ing to put you out,” and the rest, who sing “Wait for us… the flames are com­ing faster now.” David’s tale is only the first of nine frankly incred­i­ble sto­ries of this sort - by turn intrigu­ing and amus­ing, sur­pris­ing and strange. Nine Ways is col­or­ful, strange, and intense­ly mor­bid. But more than any­thing, it is an absolute­ly fan­tas­tic album. After Laugh, It’s a Fright ear­li­er this year, we were expect­ing a great sec­ond album, and we cer­tain­ly weren’t dis­ap­point­ed. From the start­ing point of its already excel­lent debut, The Chairs pro­gressed immense­ly high­er. Com­bin­ing the ener­getic musi­cal cre­ativ­i­ty of The Chairs with Alex Schaaf’s excel­lent vocals and utter­ly amaz­ing lyrics, Nine Ways is not only a great sec­ond album for The Chairs, but eas­i­ly one of the best albums this year.